Spirometry is one of the Pulmonary function test; they are useful investigations in the management of patients with respiratory disease or respiratory weakness secondary to neurological impairment. They aid diagnosis, help monitor response to treatment and can guide decisions regarding further treatment and intervention. Spirometry can measure all the lung volumes except residual volume. Preoperative evaluation prior to lung resection, abdominal surgery or cardiothoracic surgery. Before performing spirometry, the equipment used must be calibrated, or at least the calibration checked at the beginning of the session. Calibration procedures differ between devises. Read the instructions associated with your spirometer for more information. Some meters needs to be returned to the manufacturer for repair if the calibration is out. It is best practice for spirometric values to be checked on a weekly basis using a biological control (a healthy person working in your team). Feet flat on floor with legs uncrossed: no use of abdominal muscles for leg position. Dentures normally left in: it is best to have some structure to the mouth area unless dentures are very loose. Use a chair with arms: when exhaling maximally, patients can become light-headed and possibly sway or faint. In the hospital setting, it may be impossible for your patient to sit in a chair, therefore, the position of the patient (usually supine) should be the same and documented for future testing. 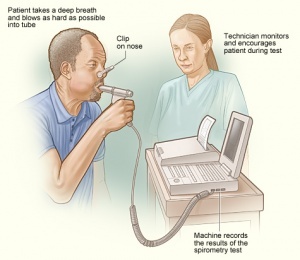 There are a number of different techniques for performing spirometry. However, most commonly the patient takes a deep breath in, as large as possible, and blows out as hard and as fast as possible and keeps going until there is no air left. PEF is obtained from the FEV1 and FVC manoeuvre. Encouragement makes a big difference, so don't be afraid to raise your voice to encourage the patient, particularly near the end of the manoeuvre. The patient needs to keep blowing until no more air comes out . Some patients, particularly those with obstructive disease, may find it difficult to exhale completely on a forced manoeuvre. The manoeuvre was performed with a maximal inspiration and expiration. No glottis closure or cessation of airflow occurred during the manoeuvre (e.g. by hesitation or blocking the mouthpiece). No coughs (particularly during the first second), inspirations during the trace or evidence of leaks. The best FEV1 and FVC can be taken from different manoeuvres. There can be problems with reproducibility: forced expiration can cause bronchoconstriction, so there must be ≥30 seconds between manoeuvres. For some patients, particularly asthmatics, several minutes may need to be left. Forced expiratory volume in one second (FEV1) The volume of air that is forcibly exhaled after full inspiration in the first second. Forced vital capacity (FVC) The volume of air that is forcibly exhaled after full inspiration. The ratio of the two volumes (FEV1/FVC) This calculation allows the identification of obstructive or restrictive ventilatory defects. FEV1/FVC <70% where FEV1 is reduced more than FVC suggests an obstructive pathology. FEV1/FVC >70% where FVC is reduced more so than FEV1 is seen in restrictive pathology. ↑ 1.0 1.1 1.2 1.3 Ranu, H., Wilde, M., & Madden, B. (2011). Pulmonary Function Tests. The Ulster Medical Journal, 80(2), 84–90. ↑ Cooper BG An update on contraindications for lung function testing Thorax 2011;66:714-723. ↑ 3.0 3.1 3.2 3.3 3.4 3.5 Moore VC. Spirometry: step by step. Breathe. 2012 Mar 1;8(3):232-40. ↑ Melam G, Buragadda S, Alhusaini A, Alghamdi M, Alghamdi M, Kaushal P. Effect of Different Positions on FVC and FEV1 Measurements of Asthmatic Patients. Journal of physical therapy science.2014; 26(4) 591-593. 10.1589/jpts.26.591.